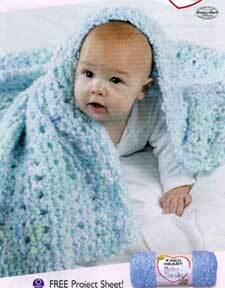 Blanket measures approximately 36 ½" square. RED HEART® "Baby Clouds™'', Art. E710 (6 ounce/148 yard solid color and 4 ½ ounce/110 yard multicolor skeins): 18 Ounces No. 9925 Playtime. GAUGE: 8 sts = 4"; 15 rows = 4" in pattern. Row 5: K3, * yo, K2tog; repeat from * to last 2 sts; K2. Repeat Rows 1-5 until approximately 36" from beginning, end by working pattern Row 5. Knit 4 more rows. Bind off. Use a short length of contrast color yarn to weave into the first row of stitches to "mark" that row as the right side. The pattern row (Row 5) is alternately worked on right and wrong side rows to keep the blanket square: first the pattern row is worked on a right side row, then 4 rows later it is worked on a wrong side row. To keep track of the number of rows you have worked between pattern rows, count the number of ridges formed by the knit rows - there should be 2 ridges above the pattern row on both sides of the blanket; then you are ready for the pattern row. ABBREVIATIONS: K = knit; mm = millimeters; st(s) = stitch(es); tog = together; yo = yarn over; * = repeat whatever follows the * as indicated.